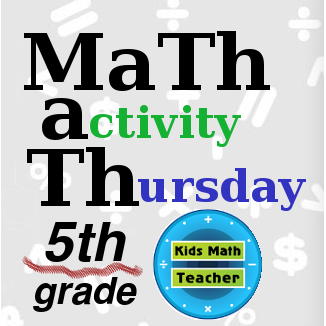 Kids Math Teacher: MaTh: Math activity Thursday for 5th graders! MaTh: Math activity Thursday for 5th graders! 5th graders are awesome! I know they can be creative and have so many neat ideas... How about this activity? Have them budget out what it would cost to produce and make a thing they really want to make! Those things are nice, but what if you wanted to make something but you wanted to turn it into a reality on a bigger scale. A few days ago I mentioned I am going to be running a Kickstarter campaign for the first book in my Kids Menu Books series. To get the The Pancake Menu novelty book to lots of parents and teachers I need help with the funding to produce it. These are some of the costs and budgets I need to research, get quotes for, and think about how much time I will be spending on everything to make sure I can fulfill all orders if it is successfully funded. Take into consideration 5% funding fee and 4% credit card transaction fees need to be worked into the total budget. There are probably numerous other things but you might not want to read them all. I bet most of your students have a project or invention they would love to make. I know my second grader has had an idea for a new kind of skateboard for a couple years. But what does he need to do to turn that into a reality? He would need to make prototypes, see how much the cost of the materials are, take into consideration how much people are willing to pay and how much time it takes to make the product. What can your student(s) create and how much would it cost for them to get it produced? How much funding would they need? About how many people would they need to buy it? If you want to get the monthly update for Kids Math Teacher and my author adventure (Kickstarter campaign aimed for January 2015) please sign up for my monthly newsletter (form in the left column just below all my contact buttons).